Speech balloons and punctuation marks are traditional two-dimensional representations of thought and sound, breath and time. By carving and modeling in plaster, concrete, bronze, I explore how the material itself holds or contributes meaning, how it speaks or signifies, and how its form creates its content. 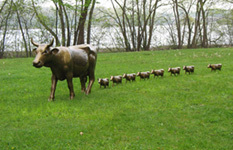 Make Way For Calflings was created for the 2006 Boston Cow Parade. It is based on Make Way For Ducklings, the beloved children's book by Robert McCloskey, and the bronze sculpture in Boston's Public Garden by Nancy Schön. This bronze plaque is a contemporary riff on traditional historical markers, designed to intensify the viewer's experience of the moment. At the same time, it explores the significance inherent in its traditional materials and form, and the arbitrary nature of what is commemorated. The River of Grass springs from a bank and meanders down the hillside at Chesterwood, summer home of sculptor Daniel Chester French. 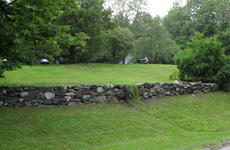 Here it flows over a retaining wall and down the hill toward the Housatonic River valley. Barbie's amazing power has led me to become a Barbiologist, studying her in my laboratory. My research suggests that Barbie brilliantly reflects our fears and our desires. 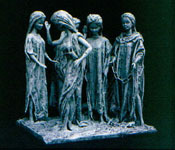 These are the Barbies of Calais, a meditation on Auguste Rodin's Burgers of Calais.